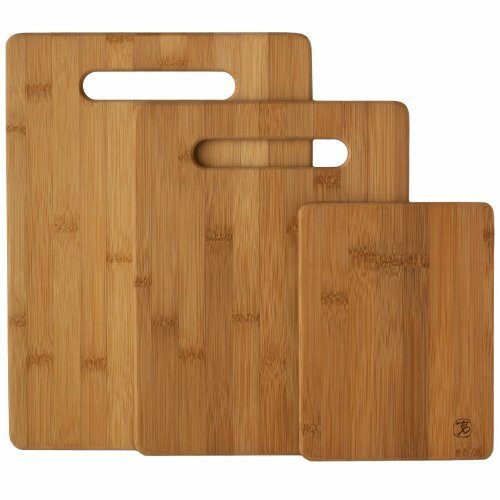 The Totally Bamboo Set of 3 Bamboo Cutting & Serving Board set is sure to find a useful place in every kitchen! The three boards included in this set cover a variety of cutting and food prep needs at an exceptional value. The included 13-inch board is great for slicing meat either cooked or raw. The 11-inch board is ideal for cutting favorite fruits and vegetables. And the lightweight 8-inch bar board is excellent for slicing garnishes or serving a selection of delicious cheeses and meats. Each board is constructed of durable flat-grain bamboo— which also highlights its natural beauty as a surface. Hand wash only. Backed by a one-year manufacturer's warranty. Bamboo is better for your kitchen. Bamboo provides outstanding "knife-feel" for a professional cut each time. Its surface is gentle on knives so they'll continue to provide clean, precise cuts. Bamboo is also an incredibly strong material— harder than maple with more tensile strength than steel! With the proper care, these boards will provide a lasting and satisfying cutting and serving surface. Bamboo is better for the environment. Totally Bamboo uses only Moso bamboo to craft its products. Moso is a large and strong timber bamboo that quickly regenerates. As bamboo is actually a grass, its roots continue to grow new shoots after harvest. Totally Bamboo uses only organically-grown bamboo that requires no pesticides, artificial irrigation or clear cutting. Bamboo absorbs more carbon dioxide than a similarly sized growth of hard wood trees and can be harvested 14 times in the span it takes for one hard wood harvest to mature. It's one amazing grass!